The U.S. Consumer Product Safety Commission (CPSC) will be issuing a warning next week on the dangers of placing baby audio and video monitors too close to cribs, bassinets, play yards and other sleep environments for babies. The CPSC reports that since 2004, at least six infants have been strangled by baby monitor cords placed too close to the crib. Most recently, in March 2010, a 10-month-old baby girl from Washington, D.C. died after she became entangled in the video monitor cord next to her crib. In addition to the deaths, other children have become entangled with cords around their necks, but were freed by caregivers without serious injury. According to one expert we spoke to, dangling cords become most dangerous when infants are first able to start pulling themselves up—around 6 to 12 months. 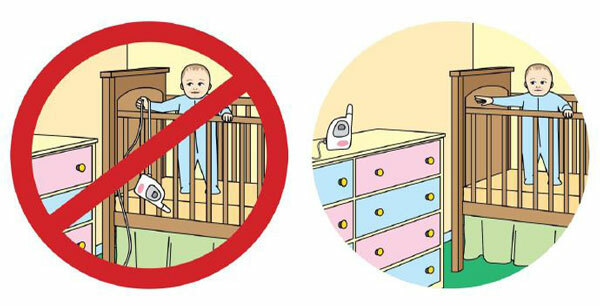 This is when infants are able to reach for cords from crib mounted baby monitors or on nearby dressers, but do not yet have the ability to free themselves if they become trapped. The CPSC is recommending that parents and caregivers use baby monitors with a cordless transmitter to avoid risk of injury or death. Or, if using a baby monitor with cords, make sure all cords are out of arms reach of your child. The CPSC is recommending following these safety tips even if your baby is not yet standing or mobile. Examine all shades and blinds to make sure all cords are inaccessible. Do not place beds, cribs, play yards and other furniture close to windows because children can climb on them and gain access to window blind cords. Remove all drawstrings from the neck and hood area of outerwear or jackets of young children, as they pose a strangulation hazard. As a professional babyproofer, I see this issue quite frequently during my home safety evaluations. I typically see the video monitor either sitting on the crib, or mounted on the wall above the crib. In either case, the monitor cord is usually within easy reach of the crib. Parents are so thankful when I point out the hazard, and often horrified at the same time when they realize the danger that had existed so close their baby. One parent even told me, “You just saved my baby’s life today.” I hope the CPSC warning helps raise awareness of this important safety matter.